This page is part of the Bea Elizabeth "Dalton" Hoax report because part of the fraud claims the "Elmore City Funeral Home" (the Yeary Funeral Home) provided funeral director and burial services for Bea Elizabeth Phillips in December of 1894 and it recently provided records of that event to the Oklahoma Department of Health to obtain a delayed filing death certificate for Bea Elizabeth Phillips. This page is to show when the funeral home came into existence and when it began to keep records, thus proving it is impossible for anyone to produce those records (unless they are fraudulent) because the funeral home did not exist in 1894 and all records before 1948 were destroyed in a fire. Edwin Hannibal "E.H." YEARY, son of Napoleon Bonaparte YEARY (1840 VA-1899 IT) and Virginia Angeline "Jensie" KESSLER (1844 MO-1912 OK), was born on July 12, 1875 in Crawford county, Missouri. Ed Yeary's parents moved their family from Missouri to Texas about 1882, eventually settling in Greenwood, Wise county, Texas. Their last child was born there in 1887 and then they moved to Lexington, located in the "Unassigned Lands" of Oklahoma Territory in what is now the state of Oklahoma. It is not known exactly when the family moved to Lexington, but their son Horace died there in 1897 and they are found living there for the 1900 census. (The Oklahoma Land Rush of 1889 allowed some 50,000 settlers to lay claim to land in the Unassigned Lands and they may have participated in that.) The first post office was established at Lexington in 1890. Ed YEARY was still at home with his parents for the 1900 census, his father having died the year before. He married Ruth Alice McCANDLESS (1879 MO-1971 OK) daughter of John McCANDLESS (1829-1899) and Eliza BRIGGS (1843-1881) on June 26, 1904 (i.e. his funeral home had nothing to do with Bea's death ten years earlier in 1894. Ed Yeary worked at the Elmore General Store (aka Black's General Store) selling caskets. After his marriage in 1904, he opened the Yeary Funeral Home. Ed and Ruth YEARY had 5 children: Dr. Glenn Hannibal YEARY (1905-1975); Evelyn Leon YEARY (1907-2003); Doris F. YEARY (1909-2001); Agnes YEARY (1911-2010); and Edwin Curtis YEARY (1916-2002). His daughter Evelyn married Wm. Thos. VAUGHN in 1937. In 1938 Ed had a heart attack and William and Evelyn VAUGHN returned to Elmore City to help run his business. They became licensed embalmers and funeral directors in 1939. E.H. YEARY died on January 14, 1958 in Elmore City and was buried in Elmore City Cemetery. William VAUGHN purchased half interest in the business after Ed YEARY died and later purchased the rest. The funeral home transitioned from being the Yeary Funeral Home to the Yeary-Vaughn Funeral Home and finally the Vaughn Funeral Home. Shortly before William's death, the business was sold and became the Wooster Funeral Home. I am Edwin Hannibal Yeary's granddaughter. Evelyn Yeary was my mother, and William Thomas Vaughn was my father. When my mother and father were married on May 13, 1937, my father was working in New Mexico. They returned to Elmore City in late 1938 because my grandfather had had a heart attack then a stroke, and my grandmother needed help. They lived next door until after my grandmother's death. To my knowledge there was never an Elmore Funeral Home. Ed Yeary worked at the General Store where they sold caskets - no services - just caskets. Ed Yeary did not have a funeral home until after he married my grandmother Ruth Alice McCandlis on June 25, 1904. At the beginning, the name was Yeary Funeral Home - never Elmore Funeral Home. In 1939 my father and mother went to Kansas City long enough to attend Williams Institute of Mortuary Science. They were both then licensed embalmers and funeral directors. The business remained Yeary Funeral Home until after Ed Yeary's death on January 14, 1958. My father then bought a half interest in the business, and it became Yeary - Vaughn Funeral Home. Dad later bought the other half and it became Vaughn Funeral Home. It had never been out of the hands of my family until Dad sold it to Charles Wooster not long before Dad's death. I don't see how he (E.H. Yeary) could have had anything to do with the burial in question when he didn't live in Elmore City. I'm not sure when the family moved from Greenwood, Texas to Lexington, Oklahoma Territory, but the last of his sisters was born in Texas in 1987 (sic 1887), and Granddad still lived with the family in Lexington at the 1900 census, his father having just died in 1899. E. H. Yeary was not ever out of the business after 1910 until his heart attack. I think the question about records for 1894 is moot, but the records stayed with the Funeral Home when Dad sold it. If you want to check with the Woosters, they could certainly check to see if there are records there. 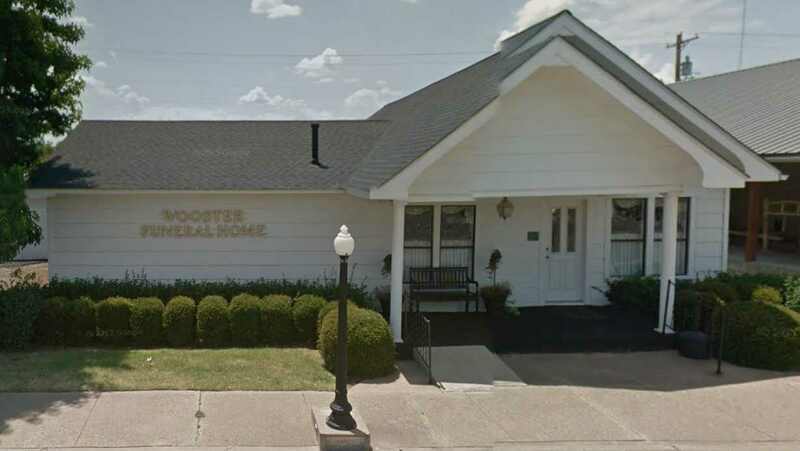 Charles Wooster is now at Wooster Funeral Home in Pauls Valley, OK, and Gary Wooster is at Wooster Funeral Home in Elmore City. At the 1940 census time, I think Granddad was in the hospital in Oklahoma City, but I'm not sure. He definitely still lived next door to my parents in Elmore City. Source: email from Susan Vaughn of March 9, 2014. 1875 - Edwin Hannibal YEARY was born in Missouri. ca 1882 - the YEARY family moved to Wise County, TX. 1885 - The junction in the road in Indian Territory that was to become Elmore City was known as Rock Creek and recorded its first residence. (The road junction was also called Banner). June 1887 - the YEARY's last child born in Wise County, TX. 1888-1895 - The YEARY family moved to Lexington, Oklahoma Territory (They were there before spring of 1895 as Ed's brother Horace died in Lexington March 28, 1895). 1890 - The first business (Black's General Store) opened at Banner as did the first post office named for J.O. Elmore (see Elmore City). 1894 - Bea Elizabeth Phillips died Dec. 28. There was no funeral home, no funeral director. Caskets were sold at Jasper Black's General Store and it performed no burials or other services. 1894 - E.H. YEARY was 19 years, 6 months old when Bea died. He was working on his father's farm in Lexington, almost 50 miles away from Tussy (where Bea died and was buried). 1898 - Elmore incorporated as a city and Jasper Black, owner of the General Store, was elected the first mayor. 1899 - N.B. YEARY, Ed Yeary's father, died in February in Lexington. 1900 - Ed YEARY is on the Lexington census as a farmer, 24 years old, and living at home with his widowed mother in Lexington. 1904 - Ed YEARY married Ruth McCANDLESS in June. 1904 - began working at the Black's General Store in Elmore selling caskets. 1904-1910 - founded Yeary Funeral Home. 1910 - Ed Yeary is living in Elmore working as an undertaker making coffins and caskets. 1911 - Banner renamed to Elmore City. 1920 - Ed Yeary is living on Missouri Street in Elmore City and his occupation is farmer. 1930 - Ed Yeary is living on Missouri Street in Elmore City and his occupation is undertaker. 1937 - Ed Yeary's daughter, Evelyn, married William Thomas Vaughn and moved to New Mexico. 1938 - William & Evelyn Vaughn returned to Elmore to care for Evelyn's father who had had a stroke. 1939 - Wm. Thos. & Evelyn Vaughn attended Williams Institute of Mortuary Science in Kansas City and became licensed embalmers and funeral directors. 1958 - Edwin Hannibal Yeary died. 1958 - William Thomas Vaughn purchased half interest in the Yeary Funeral Home and it became the Yeary-Vaughn Funeral Home. 1971 - Ruth (McCandless) Yeary, E.H. Yeary's widow, died. bef 1983 - The Vaughn Funeral Home was sold to Charles Wooster and it became the Wooster Funeral Home. 1983 - William Thomas Vaughn died. They are the earliest records available for funerals conducted in Elmore City. Earlier records were housed in the hardware store at the south end of main street and at this time are believed to have been destroyed. These records were copied and indexed by Marsha Burleson Miller, Ada, Oklahoma, 1994. 1900 census of YEARY family.